What's the big deal about choosing nontoxic cleaners in your home? Well, let me ask you this, if you found out that the cleaners you are currently using could cause cancer, damage hormones or cause other serious health problems for you and your family, would that be important to you? If I told you that toxic chemicals found in common household cleaners, pollute our public water supply, would that be important to you? to emit volatile organic compounds. These (VOC's), even in small doses can cause headaches, dizziness, irritability, confusion, lack of concentration, as well as irritation to the eyes, nose, throat and mouth and skin. They also are linked to cancer and other serious health problems. 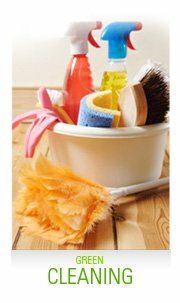 Many household cleaners also contain phlalates which are known to be hormone disruptors. These chemicals also end up in our water after they have gone down our drains. By using nontoxic cleaners, you will eliminate one of the most dangerous sources of health hazards in your home and help to reduce environmental pollution. The nontoxic cleaner I use and recommend is called Enviro-One. This green, nontoxic cleaner is one of the purest natural cleaners available in today's market. Enviro-One cleaner can address your toughest cleaning problems, including even pet urine. Enviro-One also has a vegetable wash and even a personal cleansing wash made from all natural ingredients. To learn more about Enviro-One Cleaners, click here. According to the EPA, hazardous household cleaning products are the second most common source of pediatric poisonings and are associated with an annual average of 39 deaths of children under age 5, with an estimated 87,700 children being treated each year in the hospital. With Enviro-One cleaner, this danger is eliminated. If a child managed to drink it, they would not suffer harm. Dishwasher detergents contain the most dangerous chemicals in the kitchen, accidentally poisoning more small children than any other household chemical. Even if you do not have children, the fumes from dishwasher detergents cause numerous adult aliments ranging from headaches to irritability. In addition to dishwasher detergents, all-purpose cleaners, ammonia-based cleaners, liquid dish soaps, bleach, disinfectants, drain cleaners, glass cleaners, and scouring powder contain dangerous chemicals. Carpet cleaners, room deodorizers, laundry softeners, laundry detergents, anti-cling sheets, mold and mildew cleaners, and spot removers all usually contain irritant or toxic substances. How many of these toxic products are in your home right now? Sodium hypochlorite (in chlorine bleach): if mixed with ammonia, releases toxic chloramine gas. Short-term exposure may cause mild asthmatic symptoms or more serious respiratory problems. Ammonia (in glass cleaner): eye irritant, can cause headaches and lung irritation. Phenol and Cresol (in disinfectants): corrosive; can cause diarrhea, fainting, dizziness, and kidney and liver damage. Formaldehyde (a preservative in many products): human carcinogen; strong irritant to eyes, throat, skin, and lungs. Perchloroethylene or 1-1-1 Trichloroethane solvents (in spot removers and carpet cleaners): can cause liver and kidney damage if ingested; perchloroethylene is an animal carcinogen and suspected human carcinogen. Naphthalene or Para dichlorobenzene (in mothballs): naphthalene is a suspected human carcinogen that may damage eyes, blood, liver, kidneys, skin, and the central nervous system; Para dichlorobenzene can harm the central nervous system, liver, and kidneys. Hydrochloric acid or Sodium Acid Sulfate (in toilet bowl cleaner): either can burn the skin or cause vomiting diarrhea and stomach burns if swallowed; also can cause blindness if inadvertently splashed in the eyes. Fragrances containing phthalates, (in fabric softeners, cleaning products, plastics, and personal care products) are now being recognized as hormone disruptors, which may cause genital birth defects in males as well as cancer later in life for females. They are also respiratory irritants to many people. Are you beginning to see why using nontoxic cleaners such as Enviro-One is so important. If you are looking for cleaning products that can clean as well as, or even better than most well-known national brands but without the dangerous chemicals that can bring harm to you and our environment, this is the ONE. Here is a list of cancer causing chemicals that you can feel certain that you are avoiding when you use nontoxic cleaners such as Enviro-One. water filtration system in your home. You may also want to consider using an indoor air purification system to help insure that the air you and your family breaths is as fresh and pure as possible. Congratulations! By making a commitment to use nontoxic cleaners in your home, you have taken an important step toward creating a nontoxic environment in your home.